It’s only been a month and a half since I cast on for these socks in Atlanta and the pair is almost finished. The first sock, in all its toe-up, self-striping, 3x1 rib glory, is bound off. The second sock is not. The first sock has a heel. The second sock does not but soon will thanks to an awesome technique called the Afterthought Heel. When it comes to socks, I’m usually a big fan of the gusset and heel flap since the combo fits my feet really well; however, the socks I’ve made from Cat Bordhi’s Personal Footprints for Insouciant Sock Knitters have shown me that I don’t need a gusset to have a well fitting sock. So, when I started the socks and wanted even stripes all the way up, I decided to try an afterthought heel with 3x1 ribbing on the instep to help the fit. The rows would stay the same width, and I wouldn’t have to worry about where to start the gusset increases or measure the sock every 5 minutes while stuck in Atlanta traffic. I could just knit and put my mind on other things. Most afterthought heels call for knitting in a half row of waste yarn where the heel should go which leaves a gap in each of the corners. In Personal Footprints, Bordhi has a great alternative that prevent gaps and is very easy to knit from. You just can’t be afraid to cut your knitting. Honestly, it’s not as scary as it sounds. When you reach the spot for the heel (Most patterns mark this as 2” or 2.5” less than the total length but I only needed an 1.5”. My sock came out .5” short but still fits well so the measurements are forgiving.) or come back to it after a few more inches of knitting, thread a lifeline through through the sole stitches on one row of the sock and the sole stitches two rows up. Come back and slip your needles back into stitches on the lifeline. Pull out the lifeline. Pick a stitch in the middle of the middle row and snip. Unravel the remaining middle stitches but leave the last 2 at each corner. They prevent those annoying gaps. You’ll knit the corner stitches just like normal stitches. 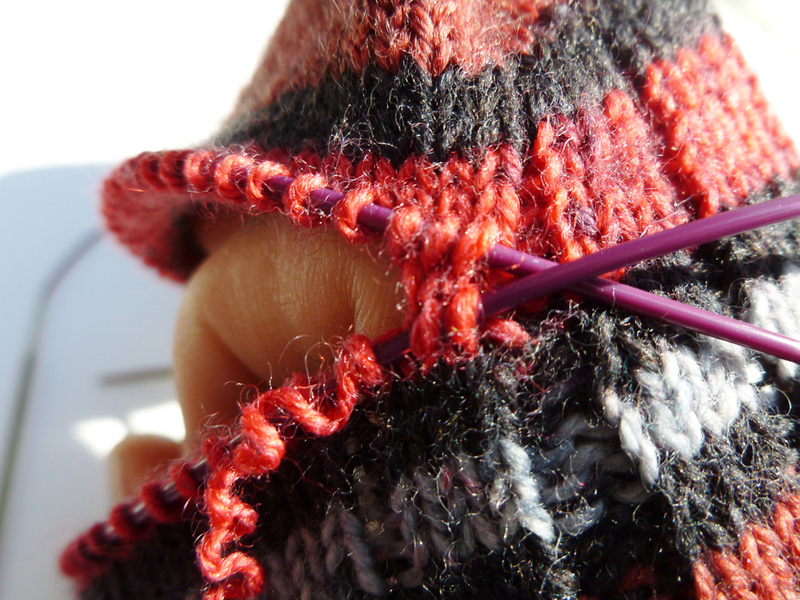 With new yarn, start knitting a toe. I went for a standard wedge toe and to help the “toe” fit better I decreased on the last 2 rows to round out the shape. Then, I grafted the remaining stitches. Feel free to drop in any toe you like. Cat Bordhi has a great video demonstrating this technique on a pair of Houdini Socks (Afterthought Legs!) that I highly recommend. Sock one is all finished and I am in love. The stripes are even, the heel looks great, and the fit is wonderful. Now I just need to finish up sock number two before the weather turns much colder.